Monte Turrentine, owner of Legacy Cleaners, is proposing a large mixed-use project on the site of the cleaners and surrounding properties. 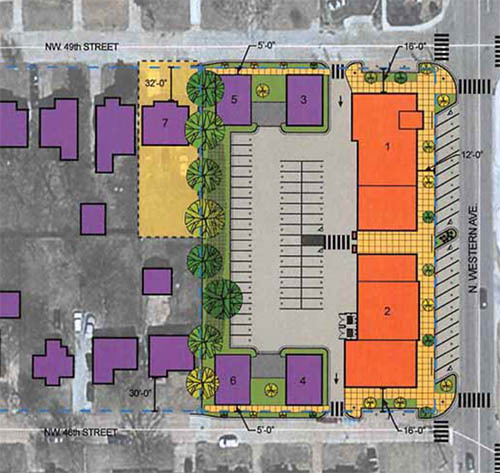 Dubbed Helm on Western, the project would feature retail / restaurant space along Western Avenue with apartments above, parking behind and five single-family residences to the west. Turrentine has been assembling properties in the area for several years and the new development would require demolition of a few small houses along NW 48th and 49th along with the cleaners property itself. Western Avenue continues to boom with a recent streetscape project nearing completion and the addition and/or renovation of several bars, restaurants and retail businesses. Architect is Smith Design Company of Oklahoma City. Looks like a fantastic project. It's nice to see Western get some new urban development. There's great potential in that area and I feel like it has kind of flown under the radar in recent years. I particularly love how it brings buildings out to the street. That'll help to extend walkability to the north edges of the district. Really liked the angled parking on Western as well. And one of the rare instances of residential above retail in OKC, as opposed to large complexes integrated some retail / service. I love this and it's so close to my house! This is actually pretty impressive. It would be awesome to live in one of those apartments above the retail. This is me dreaming, but another awesome place for a development like this would be across from the Tower Theater. I'm looking forward to seeing what becomes of Western Ave in the coming years thanks to the updated streetscape. Did you buy a house or are you renting? Didn't know you moved from DD. Monte is a good guy. This is a downright impressive project. I hope we can do whatever it takes to make this a success. I think in a way we already have with the public investment in Western. I love the strong 40s art moderne nod. This mid century stuff is becoming OKC's unique identity. Bought a house in August, just north of Putnam Heights. While it's certainly not urban in design, the Lightening Creek Apts. on S. Western just north of 81st street are like that. This passed the Planning Commission without any protest from neighbors. Now, just needs final blessing from City Council which is typically a formality. This, with the new streetscape project that will create more curbside patios and walkability, will really change Western Ave.
Glad to hear no protest. I wonder if folks along Western Avenue have given up protesting any and all development? Or perhaps they all agree it's great, responsible development that will benefit the area. What is the word on this? Has anything moved? Is this still going to happen or has it stalled? Pete, is this project dead? Don't think it's dead. They own the land and have approvals. Sometimes projects just take time. Good this isn't dead. This, 701 Hudson, Spring Creek expansion, and Glimcher are my favorite projects in OKC right now. First National is going to be hard to beat. I knew there was one I was forgetting. FNC and Pioneer Building renovation and conversion. I don't know why I'm so anxious to see the Pioneer building come back to life but I am. Once this batch of developments is underway even without some of the large ones like say for example Glimcher, Strawberry Fields, and Lincoln and I-44 development all don't happen, the current crop of development will really improve the city and prepare it for a new level. I only hope we get some new exciting announcements, seems it's slowed a bit. The 2017 GoBond will be exciting to see with specific projects listed and approved to be voted on. Wheeler Distict, AICC, Glimcher, Strawberry Fields, and COOP site might have some announcements for 2017 I'm hoping. 2017 could shape up to be an exciting year. Are they holding off due to the shaky local economy or is there some other reason? The local economy isn't really shaky at this point.